and do the differentiations. That works but can be tedious. and picked out the formulas from page 26 of that book. However, that book scared me with all its old German and Hebrew notation. way that book deals with the problem of finding the derivatives of invariants. C. Truesdell and W. Noll. The Non-linear Field Theories of Mechanics. Permalink Submitted by Amit Acharya on Sun, 2007-05-13 23:09. Indeed, algebra and calculus of the type that never loses its charm. Another way: The derivatives of the first and second invariants are easily done by realizing that the trace of a second order tensor is its inner product with the identity. For the second invariant, couple this observation with the chain rule. The third invariant, as well as the derivative of the inverse of a (invertible) tensor is more interesting. I learnt the following from my advisor Don Carlson. Once you know how to do the derivatives of the first and second invariants as above, and then realize that a tensor satisfies its own characteristic equation (Cayley-Hamilton theorem), then taking a derivative of the tensor characteristic equation gives the derivative of the third invariant in terms of the derivatives of the first two invariants, and the derivatives of the tensor itself and its square. Multiply the tensor characteristic equation by the inverse of the tensor and then take a derivative; then, if one knows the derivatives of the invariants, then the derivative of the inverse falls out. The next interesting question is how to do all this if the domain of these functions was a nontrivial manifold, e.g. suppose your s was incompressible (i.e. det s = 1). Of course, even with the inverse there is a bit of an issue to wade through as the set of all invertible second order tensors is not a vector space, but one gets away because it is at least an open set and diferentiation works out as sufficiently small excursions from a point in the domain remains in the domain (a requirement for, say, your definition of the directional derivative to make sense). Permalink Submitted by Biswajit Banerjee on Mon, 2007-05-14 14:56. Thanks for the pointer. I'll try to write out the derivation when I get the time and post it here. Could you elaborate on why "the set of all invertible second order tensors is not a vector space" and how that affects differentiation? An example of a situation where an excursion leaves the manifold will really be helpful. Permalink Submitted by Amit Acharya on Mon, 2007-05-14 23:36. Consider the invertible tensors I and -I. Their sum is not invertible. Hence. not a vector space. Differentiation of a function at x requires the value of the function to be defined at x + h for h sufficiently small. If the domain of the function involved is a vector space this is not a problem, and it is not a problem even if it is not the entire space but only an open set of a vector space. d/ds φ(f(s))|s=0, where f is a curve on the manifold with f(0) = x.
grad φ = φ_,i e^i where (e^i) is the dual basis corresponding to the parametrization. Thus the gradient vector is tangent to the shell whereas if φ was defined everywhere then the gradient vector would have a component normal to the shell. Practically, this comes up all the time when dealing with finite rotations in FE implementations of shells, while deriving Jacobians. does the point leave the surface? Permalink Submitted by Nachiket Gokhale on Tue, 2007-05-15 20:51.
not strictly defined for every non-zero tangent vector h, however small. I think this is because the point (x+h) leaves the surface of the shell. Am I correct? Permalink Submitted by Amit Acharya on Tue, 2007-05-15 21:04. Permalink Submitted by Amit Acharya on Mon, 2007-05-14 07:39. Of course, the easiest way for the deriv. of the inverse is to work from SS^-1 = I.
Permalink Submitted by Attila Kossa on Sat, 2012-02-25 18:52. There is a tricky question: why do we get different result for the derivative of J3 with respect to s if we start from the definition J3=1/3*Tr[s^3] ? 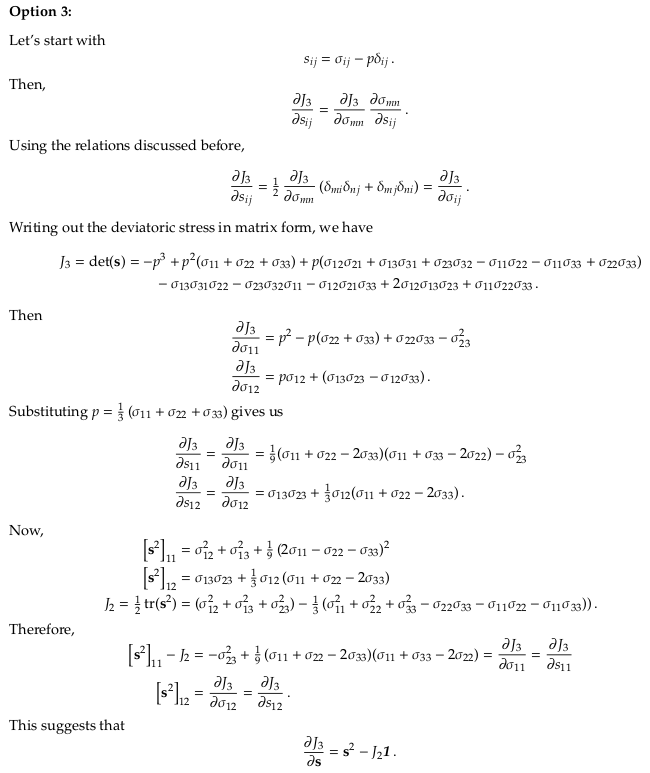 Permalink Submitted by Biswajit Banerjee on Sat, 2012-02-25 23:10.
s is the deviatoric part of sigma and Tr(s) = 0. P.S. This comment is irrelevant. Please disregard. Permalink Submitted by Amit Acharya on Sun, 2012-02-26 13:41. 1) Biswajit's formula above is valid only when the symmetric deviatoric tensor where the derivative is being done is invertible. A general traceless tensor need not satisfy this condition. 2) The other question that just occurred to me (and I have not thought about it much at all) is, if we think of J3 in your case as defined on the space of symmetric deviatoric tensors, which is a vector space (as far as I can think of), then calculating the gradient of a differentiable real valued function on this space should yield an element of the space itself - i.e. a symmetric deviatoric tensor. So as you say, s^2 need not be deviatoric, so what are you thinking of as the domain of the function J3 you consider - symmetric-deviatoric tensors, or only symmetric tensors, or invertible-symmetric-deviatoric tensors? I note here that if we were to consider the fn J3 to be defined on the domain of invertible, symmetric deviatoric tensors the formulae that both you and Biswajit write will have to be corrected to remove their hydrostatic parts to obtain the gradient and then they would yield identical formulae. Permalink Submitted by Biswajit Banerjee on Sun, 2012-02-26 17:04. Agree with your caveats (1). It's been a long time since I thought about these things and I can't recall where I first saw that result. But it did look strange and hence the contortions to get to it. (2) is quite a bit deeper and I hadn't thought in those terms. That's worth more examination from others in this forum. Permalink Submitted by Attila Kossa on Mon, 2012-02-27 02:29. I made a detailed derivation steps regarding to my question. 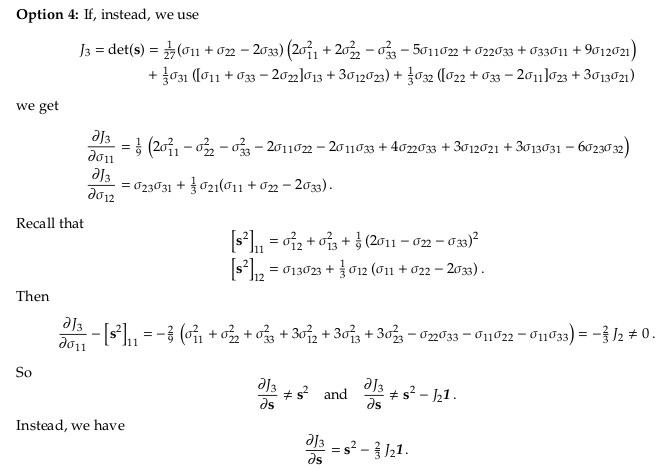 I think method 2 is the correct solution for the derivative of J3. But what about Method 1? Permalink Submitted by Biswajit Banerjee on Mon, 2012-02-27 21:48. Permalink Submitted by Attila Kossa on Tue, 2012-02-28 04:18.
when you compute d(J3)/d(sigma11), I think you forgot to compute d(p)/d(sigma11). p itself is obviously depends on sigma11. Therefore a term 1/3 is missing in that line, I think. Permalink Submitted by Biswajit Banerjee on Tue, 2012-02-28 15:14. The point of the above was to show one way in which brute force can be used to get solution 1. We have assumed dJ3/dp = 0. But, as Amit had pointed out somewhere else, dJ3/dp derivative is ill defined because J3 can take an infinite number of values for a given p.
Option 4, dJ3/ds = Dev[s^2], gives you the tracefree solution that Amit points to, i.e, the solution that is tangent to the DevSymm manifold. Permalink Submitted by Gayan Aravinda on Mon, 2015-10-05 08:27. Permalink Submitted by Biswajit Banerjee on Mon, 2012-02-27 22:48. Permalink Submitted by Amit Acharya on Mon, 2012-02-27 23:13. What's going on here is interesting indeed. Without loss of generality, let's consider your (1) to be valid for symmetric second order tensors and (2) to be valid for symmetric, invertible second order tensors. The first equality there holds if you view J_3 and tr(s^3) to be defined as functions *ONLY* on the space of symmetric deviatoric tensors. If you go off the manifold defiend by tr(s) = 0, then that relation does not hold. This result holds for all symmetric deviatoric tensors, whether invertible or not. Now let's go to your Method 1: The definition 5 and formulae 2 and 7 require J_3 to be defined only on the space of invertible symmetric tensors (no deviatoric requirement).The gradient of J_3 on the space of invertible symmetric tensors is indeed given by (7) - the domain is not a vector space but an open set of the space of symmetric tensors and this suffices. If you now ask for what the gradient of the J_3 should be on the space of invertible, deviatoric symmetric tensors, then again you take the formula in 7 and subtract off its component along I/(sqrt 3) and you get the eqn (**) above, by using your (8) and (9) which is valid for symmetric deviatoric tensors. So d J_3/ds on the space of symmetric, invertible deviatoric tensors is the same no matter what formula you use. Of course, your corrected method 2 is more general because it gives the formula on the whole space of symmetric deviatoric tensors. Permalink Submitted by M. Jahanshahi on Tue, 2012-02-28 03:45.
actually means that we are computing the tensor tangent to the constraint manifold. This is the key difference between the derivations in previous posts. But the questions is that how we can compute the normal to this manifold (or what is the equation for this manifold) and why the derivative of J_3 should be tangent to the constraint manifold (in some sense a covariant derivative on constraint manifold)? Permalink Submitted by Amit Acharya on Tue, 2012-02-28 10:15. Your remark about the derivative being tangent to the constraint manifold is correct - see my comment entitled "Differentiation" earlier on in this post (from a long time ago). The equation of the manifold is tr(s) = 0 (it is actually a linear subspace of the space of symmetric second order tensors) - for the invertible part, one has to do a little song and dance but things work out as if you did not worry about the invertible part. The way you calculate the normal is as one learns in advanced calculus - you calculate the gradient fo the function that defines the level set. Assuming the Froebenius norm on the space of second order tensors (i.e the trace inner product metric) is involved in this calculation as in forming the unit normal. Look at my comment on "differentiation" above and let me know if that clarifies your question about why the 'derivative' of J_3 on a manifold should be tangent to the constraint manifold. Permalink Submitted by M. Jahanshahi on Wed, 2012-02-29 01:52. If I'm correct, this means that we want to keep the derivative onto the constraint manifold and if not so, the constraint would be meaningless (there would be no difference between derivatives of deviatoric symmetric invertible tensors and derivatives of symmetric invertible tensors). But as a consequence of this constraint all the derivatives of deviatoric symmetric invertible tensors should be traceless (such as dJ_3/ds in our discussions). Should it be the case? Permalink Submitted by Amit Acharya on Wed, 2012-02-29 10:00. In everything you say above, I suspect you mean derivatives of real valued functions of (deviatoric) symmetric tensors and not derivatives of the tensors themselves. For the answer to the question you ask, see my comment on Feb. 26 in this post entitled"Re:J3 derivative", item 2). L(h) = l.h for all h in the vector space. If L was the derivative of the real valued fn. we are thinking of, l is the gradient of the function. In our discussion, det(S) and (1/3)tr(s^3) are equal real-valued functions on the set of deviatoric symmetric tensors. Thus it only makes sense to ask that their derivatives, or their gradeints in the above sense, be equal in this space. But the gradients are then members of the space of deviatoric symmetric tensors. From the above definition you can now see why, if one has the gradient of the 'same' function on the whole space, subtracting off the projection of the gradient on the normal to the subspace will give the right answer for the unique gradient of the restriction of the function on the subspace. Permalink Submitted by M. Jahanshahi on Sat, 2012-03-03 13:45. In my previous post I actually meant derivatives of real valued functions of (deviatoric) symmetric tensors (such as invariants of that tensor as in our discussion) and not of course tensor valued functions. By the way, your comments concerning the gradient and derivatives of real valued functions of (deviatoric) symmetric tensors are very helpfull. Permalink Submitted by Attila Kossa on Tue, 2012-02-28 04:28. My question is related to real-valued symmetric second order invertible tensor s.
Only one solution should exist for the derivative of J3 with respect to s.
In this general case, J2 is not zero. However, Method1 and Method2 are the same only if J2=0. But, I am interested in the case when J2 not =0, J3 not =0. Consequently, I am still surprised why exist two alternatives for this derivative in textbooks. Where is the "tricky" step in the derivations causing two solutions? Permalink Submitted by Amit Acharya on Tue, 2012-02-28 10:05. I gave you the unique solution for the gradient of J_3 as a function of symmetric deviatoric invertible tensors, as well as symmetric deviatoric tensors. J2 does not have to be zero for that answer to be valid. I haven't checked what the text books exactly state for the gradient of J2 on the space of symmetric deviatoric invertible tensors. However, where your derivation goes wrong is in interpreting your first equality in (11), , as valid on the whole space of symmetric tensors. This is not true. The second equality in (11), , is true in the whole space. if you restrict attention to the subset where J_3 is indeed equal to 1/3tr(s^3), i.e deviatoric tensors, on that set the two 'derivatives' match indeed, as I showed. May be it is easier to see what is going on in a simple setting - take two real valued functions defined on the x-y plane. Let these two functions agree on a straight line in the x-y-plane - so think of two arbitrary surfaces that intersect on a straight line. Would it be reasonable to expect that the gradients of the these two functions should be equal everywhere just because their values match on the line? Even on the line, would it be reasonable to expect the 'derivative' of the functions to be equal in directions not along the line on which they have common values? Of course, if you restricted attention to the functions only along the line then it is eminently reasonable to expect that the 'derivatives' of the restrictions of the two functions on the line should be exactly equal, and indeed this is what happens. Permalink Submitted by Attila Kossa on Sun, 2012-02-26 02:48. Tr[s^2] and Tr[s^3] are not 0.